There have often been echoes of David Bowie throughout Iggy Pop’s solo work, and after the passing of the Thin White Duke, it’s especially difficult to listen to Jimmy Osterberg Jr. without hearing the former Davey Jones resonating therein. Post Pop Depression, his latest effort, was recorded last year, “secretly” by Joshua Homme of Queens of the Stone Age, featuring QOTSA’s Dean Fertita and Arctic Monkeys drummer Matt Helder. This release can’t help but bear some psychological weight from the terrorist attack at the Bataclan in Paris during a performance by Homme’s other project, Eagles of Death Metal, last November. 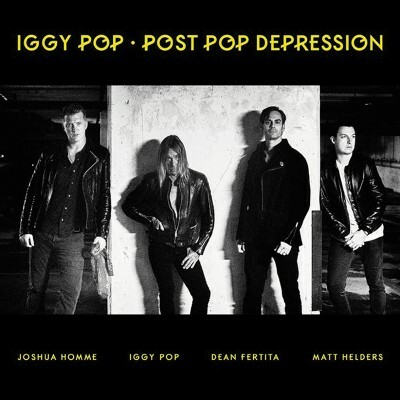 Even with the pun in the title, Iggy perhaps bummed out after the failure of his jazz stylings or life after his experiments with a kind of pop music—or even the heyday of being Iggy “Pop”—and Post Pop Depression still feels like it somehow pays Homme-age to that tragic event. The heaviness under which this album labors is actually welcome after the previous two releases, which seemed slight, artificial and not quite Iggy. From the opener, “Break Into Your Heart,” with its deviously twisted melody and typically dark declaration of affection, it is apparent the old Iggy is back: the almost unbelievably powerful performer who once sang “Gimme Danger” and made it sound delicious. These songwriting collaborations with Homme give ample evidence of Homme/QOTSA—with their deviant yet celebratory rock stylings—as Iggy’s worthy successor, though the guy is one of a kind. “American Valhalla” is slightly political, the kind of tune Iggy ventures into occasionally: “I’m looking for American Valhalla, so if it wanders by give me a holler …” a sarcastic ode to U.S. militarism, a pale echo of the Stooges’ “Search and Destroy,” about the horrors of Vietnam. The album doesn’t really kick in musically for me until “In the Lobby,” which really starts to rock. Iggy intones ominously, “Somebody is losing their life tonight.” If the album had been released pre-Bataclan, it might have been read as an omen. These songs start out a little tentatively, asking you to take time to explore the deeper cuts inside the album—for example, “German Days” exhibits a riff built around a shuffle beat that goes into a waltz tempo, and yet, it’s another of Iggy’s dark dramas, of which he is the master. While Post Pop Depression isn’t his best work by far, it’s a sharp return to form, and the album reminds us of the Iggy we used to love, who used to, as he croons on “Break Into Your Heart,” “crawl under your skin.” –Stakerized!